A good day for Hungary today. White has the bishops and a nice queenside majority. What plan do you recommend for White? White has more space but will cannot easily increase the pressure on the a-pawn. Black has the d-file for counterplay while the Na4 presses the c5-pawn. 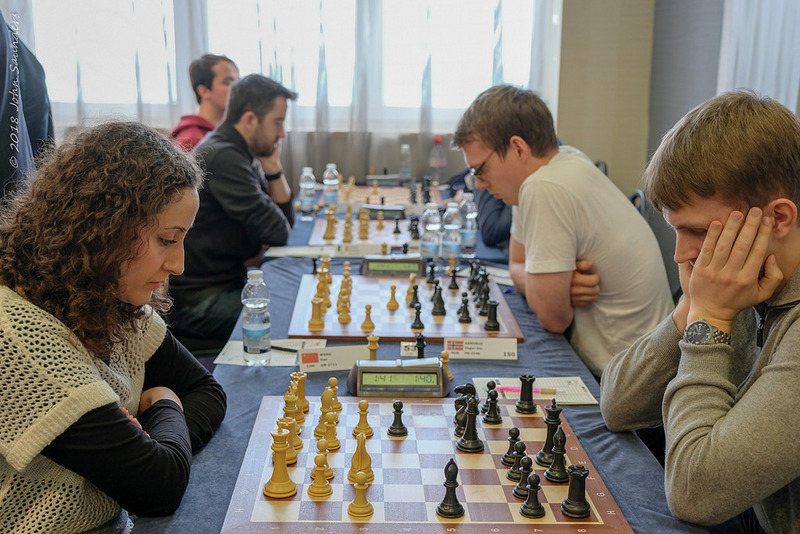 Two MTK teams were in action at the Hungarian Chess Federation. The MTK national team faced an opponent(DTSK?) fielding 7 GMs. I contributed a win but I cannot say the game was well played. White played aggressively, taking over the centre while Black unnecessarily weakening his castled position. However there were many mistakes in the game. Black has just attack the Bc7. It was a hard day for the Hungarian contingent. White has the better king and the g-file and the usual space advantage against the King’s Indian. Black is going for a kingside attack but seems to be a hitting a solid wall. Gledura keeps rolling but everyone else is slowing down.